Is illegal gambling forcing clubs to pay the price? I feel for clubs in Australia. For more than ten years now they’ve been forced to apologise for offering their members a perfectly legal form of entertainment; specifically, poker machines. Some antagonists read small sections of reports, such as the Productivity Commission Report on Gambling and claim to have all the answers. Even worse, at least one academic has engaged in poor and improper analysis of data to argue his point against poker machines. And all this time, clubs managers, staff and their volunteer committees have simply gone about their work; offering great venues to over 2.3 million members across the State. But more than 10 years of negativity has taken its toll. It seems that Queenslanders are now playing poker machines less. The numbers speak for themselves. If we take into account inflation and the growth in the adult population in this State, the average weekly expenditure on poker machines is now at $10.37 per adult, the lowest it’s been since 2006. And yes, only 30% of Queenslanders say that they play poker machines, so the measure is only really a notional measure, but a true indication of a trend just the same. This might be a cause for some to jump for joy and declare that it’s about time. That might be the right reaction if indeed it’s an indication that the 0.37% of adults in the State with a gambling problem are in fact quitting. If we scratch the surface the real story might emerge. There may be around 2,200 online gambling providers currently offering gambling services to Australians that may be in contravention of Australian law. 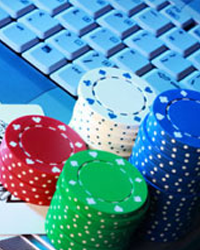 The total value of online gambling in Australia in 2010 was approximately $1.6 billion. Let’s look at the estimated amount of money spent by Australians on on-line illegal poker machines ($475 million). This large amount of money was estimated based on a survey of Australians. But is it accurate? The Australian Bureau of Statistics’ Household Expenditure Survey (HES) was last completed in 2009-10. It estimated that Australian households spent on average $5.86 per week on all forms of gambling. If this number were accurate, it would mean that the total market for gambling in Australia would be in the vicinity of $2.6 billion. But we know that it’s much larger. According to accurate data based on revenues from each gambling provider, the real total expenditure was around $18 billion. You might conclude that gambling expenditure based on survey data underestimates the real level of expenditure by 7 times. If this survey error is consistent, it might mean that the actual amount of money spent by Australians on on-line slot or poker machine is substantially more than $475 million and possibly as high as $3.3 billion. Queensland’s share of this amount of lost revenue might be as high as $550 million which equates very closely to $3 per adult per week; exactly the difference between the 2006 level of expenditure and the 2012 level of expenditure. A loss of $550 million translates to a GST loss of $50 million, lost State taxes of about $220 million and lost wages equivalent to over 300 full time jobs. So it seems that some of our customers have gone on-line and taken their gaming budgets with them. And it seems ironic then that the Federal Government is leaning towards a liberalisation of on-line gambling. Perhaps it’s time to stop apologising for operating a poker machine licence. It’s time to ask regulators for some initiatives that would lead to growth restored to the market. Interested in having your say? I’d be interested in hearing your thoughts on this at geoff@dws.net.au.